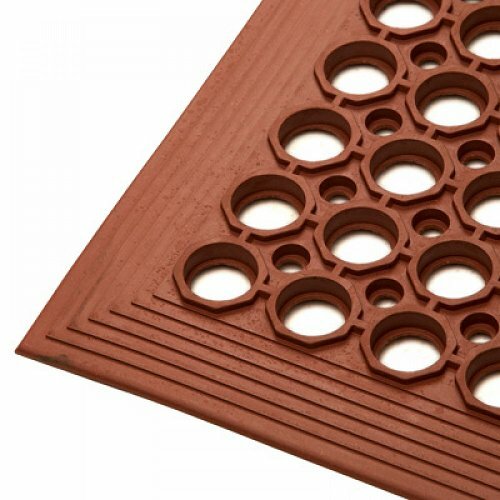 A highly versatile medium duty anti slip and anti-fatigue mat with built in ramps. Available in 2 grades - Premium Grade with a 3 year warranty and Standard Grade with 1 year warranty. Applications in Hospitality industry( behind bar and commercial kitchens), general industrial and engineering applications and a wide range of commercial applications. Good slip resistance, comfort for feet and legs and insulation from cold and heat off floors. Red Grease/Oil Resistant compound (- 75% Natural Rubber and 25% Nitrile Rubber) for moderate exposure to grease and oil.